aaronwilson.org: To Sing or Not To Sing? I've been afforded a great privilige to join some men from another church (the church under who's ministry I heard the gospel and was converted 14 years ago) in the study of the book, Fool's Gold, (John MacArthur, general editor). Last night we discussed the chapter on contemporary music in the local church, but primarily focused our attention on the suggested standards for music/worship within our churches. One point that was briefly mentioned by MacArthur, yet thoroughly discussed by our group, was the issue of un-skilled or un-trained musicians/vocalists having a platform in the worship service to sing or play. In other words, if someone just cannot sing well (or play well), should they be given an opportunity to sing a solo during church anyway. After all, isn't the more important thing that their heart is in the right place...that they're sincere...etc? This made for interesting discussion, to say the least. And I don't know that we came to any final conclusion or agreement on the subject. I've seen some churches who will allow pretty much anyone to sing anytime and sing anything they want to - no questions, no pre approval, no verifying that the song is biblical and God honoring. 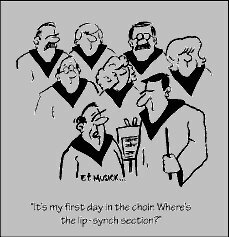 I've seen another church that allows anyone to sing in the choir or play in the orchestra, but is more particular about who does special music (solos & such). Which is right? Which is best? What is the standard for music within the church, and what about the sincerity or heart attitude of the musician? I don't think anyone would argue against the musician being in good standing with the Lord, having no known unconfessed sin, being above reproach, etc. But is this the only standard by which we determine who sings? By the way, a helpful appendix to this chapter on worship music is a "checklist for worship music" written by Nathan Busenitz, that really helps address this and other similar issues. 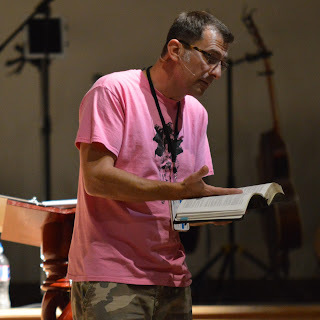 We looked at some passages such as 1 Timothy 3:1-7, and considered applying the qualifications necessary for other areas of ministry (in the case of 1 Tim 3, it would be pastors). The question was asked, if one of the criteria for a preacher is that he is "able to teach" (vs. 2), shouldn't one who is going to sing be "able to sing"? Again, this is an attempt at trying to apply principles from other passages to an area where the Scriptures aren't quite as clear. As you may guess, it was an interesting discussion. Well anyway, when I arrived home after the study and checked my email, I received the quote I've included below. The email is from Dust and Ashes, an online publisher and auctioneer of old classic books. I'm on their email list and get updates from them at least twice a month. I thought it quite appropriate and providential, in light of our discussion, and also interesting that this is the first (and apparently only) time they've included a "quote" in their email. Valdes' point deals mainly with teachers/preachers, but is certainly applicable to all areas of Christian service (i.e., music ministry). We have never had a quote of week before and don't mean to imply by the catchy title that there will ever necessarily be another, but we simply could not resist forwarding this short, pungent excerpt penned in 1557 by Juan de Valdes, a little-known Spanish reformer. These words take place in the context of his urging on all to read works on the exposition of the Scripture and this is part of his vigorous reasoning. It is too often thought today that Christ will take whatever service we give so long as it is 'from the heart'. There may be a germ of truth in this, especially in His graciously overlooking the errors of his newest lambs, but where the Lord's Word is clear but unstudied and His will knowable but unsought, we should not wonder that He is offended if we do not follow it. Valdes is urging exactly this point. If we are to be followers of Christ, it is only good sense that we study Him to see what He has done, how He has done it, and what it is that will be pleasing to Him! His quote may be to some extent hyperbolic, but the point is well taken. "I am no preacher: I am no theologian,"
shows himself thereby to be no Christian either. . .
Have you been following the "Draw Me Close" subject around the blogosphere as of late? Have not heard of it. Do tell. I believe it started off with an article, criticizing the theological content (or lack of) in a song (Draw Me Close to You), posted by Chuck Colson at Christianity Today. Justin Taylor & Tim Challies expressed their opinions on the article as did Bob Kauflin. WOW! Thanks for those links, Gary! I just spent over an hour reading all the dialogue over this whole issue. I finally left a few comments at Bob Kauflin's blog. I don't think this worship music debate is going away anytime soon. I am forgot to post the Sam Storm link, which was a crucial part to the conversation. Sorry bout that. I agree with Bob Kauflin, "...it’s a good sign that people feel strongly about these issues. We should be concerned with how we worship God, careful about what songs we sing and listen to, and discerning about our motives." Did you catch this follow-up discussion on the "Draw Me Close Conversation" at Bob Kauflin's Blog? An excerpt, "First, we need to recognize the importance of being faithful to Scripture. We aren’t simply promoting our own ideas and opinions about God. We are seeking to express what God has already spoken. That’s what theology and doctrine are – knowing and communicating as precisely and comprehensively as possible what God has revealed about Himself in His Word." Mr. Kauflins's blog is fast becoming a top fav! Also wondering did you see Todd Murray get mentioned over at Girltalk? Actually it was more than mentioned the whole post was centered around the comment he made admonishing women to be mindful of their attire on their wedding day?